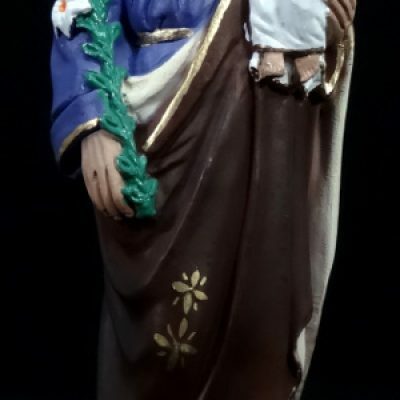 Saint Joseph is known as the father of Christ, and was known to be the son of David, the king of Israel. He was a humble carpenter, and is known for his struggles in accepting the fate of his wife, Mary, being given a holy infant by miracle. Though doubtful at first, when an angel appeared to him in a dream telling him that Mary was pregnant with a holy son, he did everything he could to protect the child as his own. He relocated to Egypt by the angels command, and then returned to secluded Nazareth later on to keep in secrecy. Joseph is the patron of the fathers, families, craftsman, engineers, travellers, and house hunters. Burying his statue upside down in your yard will help you sell your home to relocate! This image statue is 20cm tall (7.8 inches) and stands on a platform base.